A little playtime with distress inks and masking. This is gorgeous Tammy. The colours are so beautiful. Lovely play and great design, Tammy. Hoping you won't be needing this card any time soon. So very beautiful, Tammy!! What a gorgeous sympathy design! That's gorgeous and are those amazing glue dots too? Beautiful sympathy card Tammy! Sorry Lisa, no glue dots were injured in the making of this card. It is glossy accents! So gorgeous Tammy..love the little dew drops and the striking yellow..beautiful. Beautiful! Clean and simple and says it all. Love the masking and distress ink. Gorgeous card technique. I love the simplicity of the design. This is so beautiful Tammy!! Love your masked design and the subtle dots! Happy Friday! Striking and gorgeous as a sympathy card. I love the Glossy Accent dew drops. Taammy, you never fail to impress! 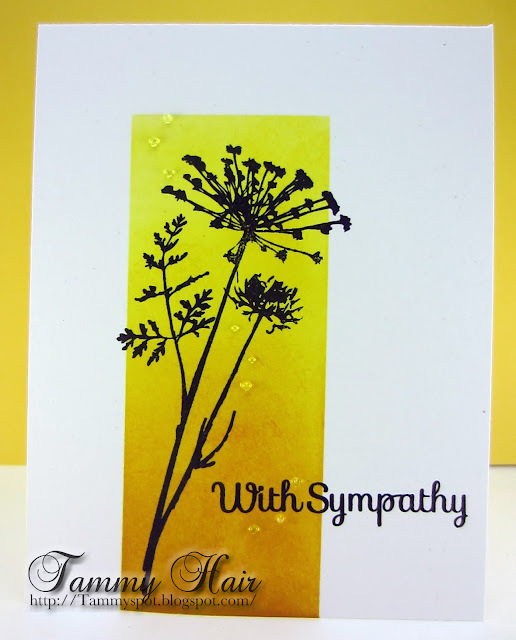 Your card is gorgeous & just perfect for a sympathy card. The warmth of the colours is so beautiful! Lovely! I really like the warm yellows and the spots of water like substance that you created.